Life’s like that: a series of twists and turns where you end up in an unexpected place. Like the best short stories, and maybe the best novels and best lives, often the journey has a long and winding road, one where you can’t see the beginning and the end along the way, but one that takes you exactly where you need to be. Or when you finally reach that spot that feels like home and you wonder: what took me so long to find this place? Not knowing … ah, keeps it interesting that way. “Long Winding Road” one of a kind custom snow globe, with clay stone steps, vintage toys and jewelry findings in a liquid-filled glass globe. When shaken, the liquid swirls with hopes and dreams, love and loss, and a few sparkles and iridescent hearts. All designs and images copyright (c) 2015 Camryn Forrest Designs, Denver, Colorado USA. Stop in to Main Street Fine Art Gallery (Evergreen, Colorado) for a wonderful display of original art from more than a dozen talented artists. It’s a unique, juried, co-op with high standards of artwork and presentation. Main Street Fine Art Gallery is run by the Evergreen Artists Association, www.EvergreenArtists.org. This year, Camryn Forrest Designs is honored to show a selection of one of a kind snow globes at the gallery for the month of December. Fancy a leisurely stroll in downtown Evergreen? The 23rd Annual Holiday Walk, Mainstreet Downtown Evergreen (Colorado), takes place on Friday, Dec. 5, beginning at 5 p.m.
– John Lennon and Robert Browning had the same idea. 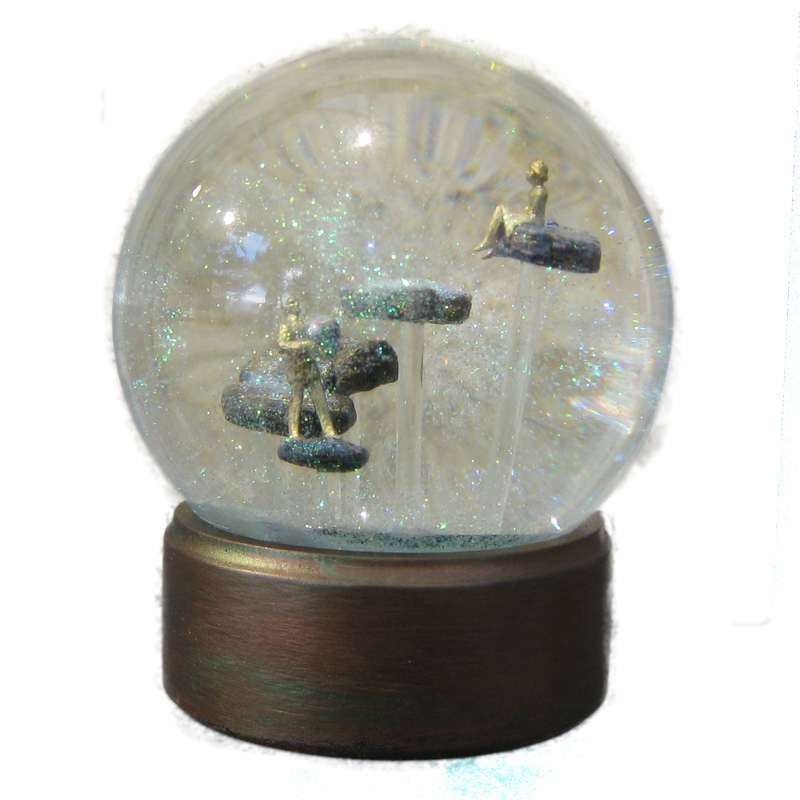 Along those simple lines, a snow globe holds a couple of indeterminate age, holding each other as the world swirls round them. Shake the globe and the liquid fills with glittering sparkles of gold; each tiny star a memory, each memory a brick in the life that’s built together. One of a kind snow globe/water ball, all images and design copyright (c) 2014 Camryn Forrest Designs, Denver, Colorado. As I pulled together the thoughts and images to post this art today, I realized that this was my 100th blog post. Back a few months ago, when I realized this “magic” number was approaching, I thought I should plan ahead and write something special. But I got busy with this and that, and the joy and heartbreak of every day life, routines and surprises, hope and disappointment and here it is: the Magic 100. And the globe that was ready to post? 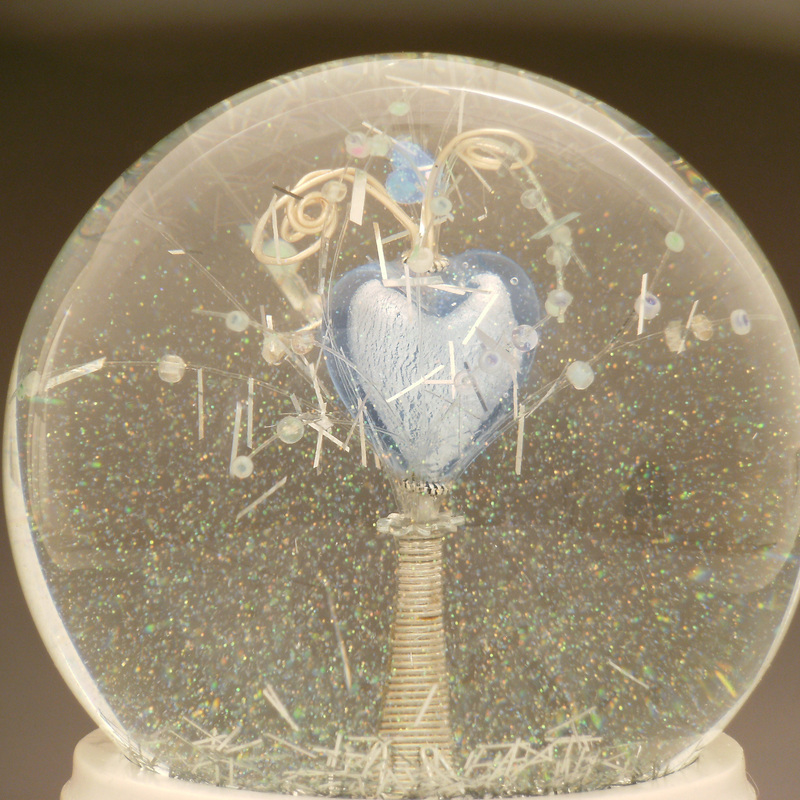 There’s a story behind this sparkly snow globe, with the dancing silver flecks, ice-blue glass heart and a just glimpse of an iridescent heart (if you don’t blink!) … but I can’t tell it here. I was inspired by someone with a true blue heart, and can only say that when you shake this globe, and the world fills with light, and laughter, and hope, for a moment you will believe. 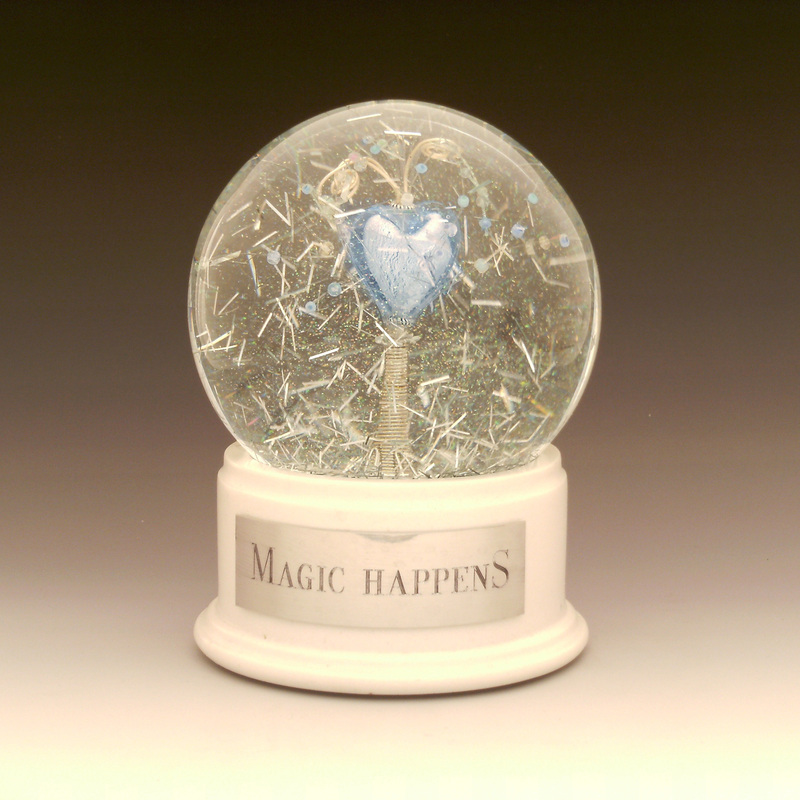 Magic Happens, one of a kind snow globe with glass heart, wire and beaded sculpture, silver dust and flecks inside liquid-filled glass ball. All images and designs copyright (c) 2014 Camryn Forrest Designs, Denver, Colorado. One of my favorite scientists talked to me about Nikola Tesla a few years ago, saying that if he’d had the support and resources, he could have done amazing things. In fact, we have no idea what he might have accomplished under other circumstances. It got me thinking. Along with developing transmission of wireless communication, sharing free energy and maybe weapons of mass destruction, could Tesla mend a broken heart? 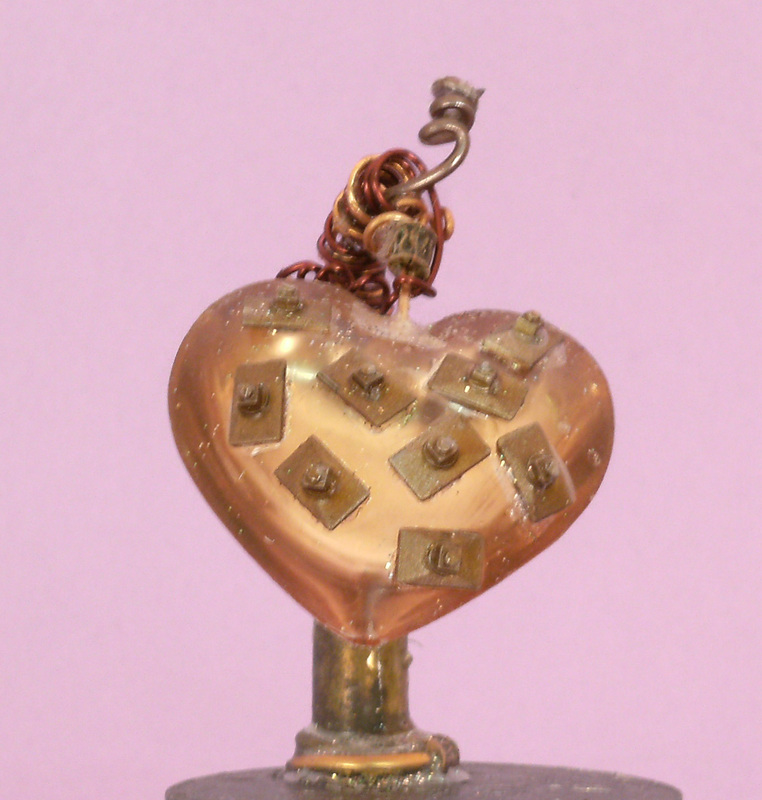 In this snow globe, a tiny Tesla is dwarfed by his machinery, including an interior liquid and sparkle-filled tube wearing the mending heart. Shake it, and the water fills with crisp gold shimmers, much like the unseen energy Tesla believed was all around us. All designs and images copyright (c) 2014 Camryn Forrest Designs, Denver, Colorado. Toughen up. Harden your heart. It’s a scary world out there. We cover our hearts with bits of protection: the scars from long-ago loves, the uncertainty about our worthiness, worry over heartbreak yet to occur. There’s a coat of armor, ready to ward off the slings and arrows of life, unpredictable alliances, fluid emotion. Yet, between the shields of protective metal, the heart glimpses through, more curious than afraid, more hopeful than defeated. Despite all precautions, the armored heart may yet be touched. 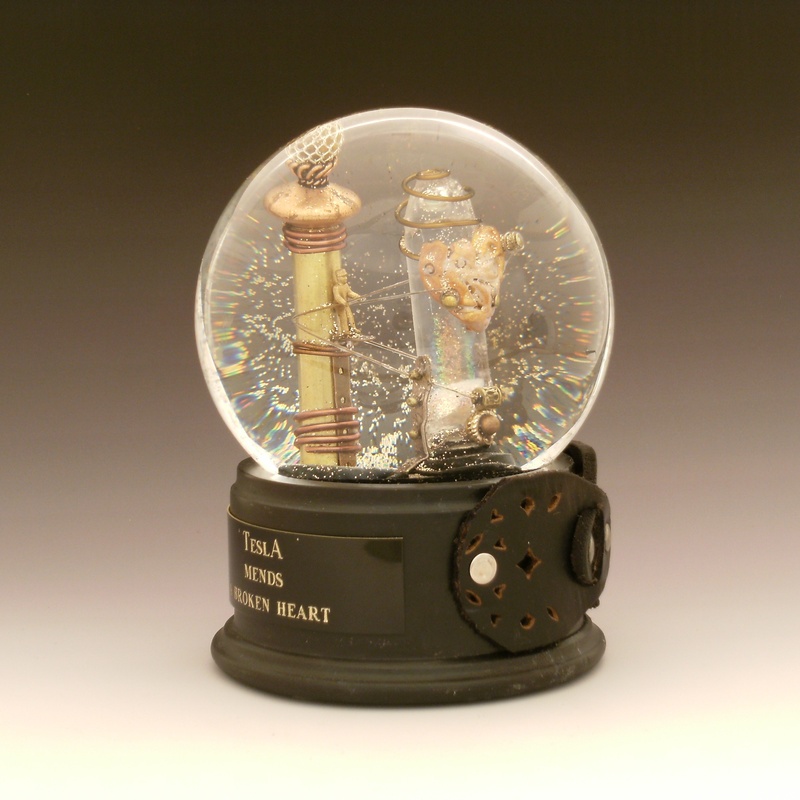 Armored Heart snow globe, Camryn Forrest Designs 2014. All images and designs copyright (c) 2013 and 2014 Camryn Forrest Designs, Denver, Colorado.